What is you turkey gun setup? Tell us about your turkey blaster? What load and choke combo work best out of your gun? Laugh all you want, but my "go to" gun is one I've carried since 1988, a Mossberg Model 500. 24" barrel, camo finish, 3" chamber 12 gauge. Factory X-full choke allows it to shoot good patterns with Federal Premium 5s. It kills 'em and it is an extension of my arm. The only thing I've done to it is add a cheap, magnetic fiber optic front sight. It helps me get on them in low light. 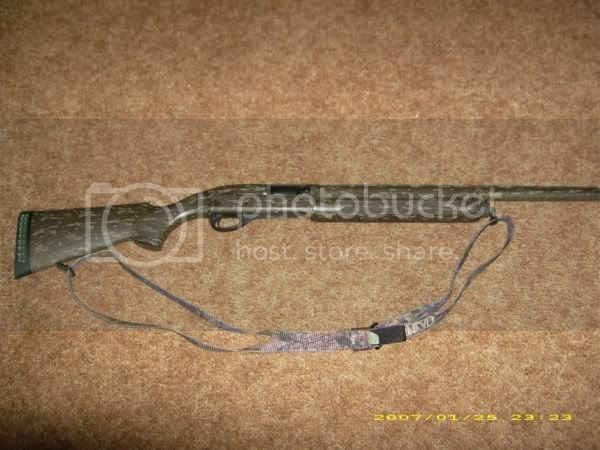 I also have a Winchester Model 1300 that I won at a DU banquet. I put a 4x shotgun scope on it with the diamond reticle. I am going to try various choke/shell combinations in this gun until I find one that works to suit me and then I might carry it some. But the Mossberg suits me just fine. I can take it apart and put it back together blindfolded. And it shoots every time. Remington 870 Super Express Magnum w/ trigger job, FC lengthened, barrel polished - Primos Jellyhead choked to .660 - X-Coil Hi-Vise recoil pad - Shooting 4x5x7.5 3.5" Nitro Hevi-shots - Topped with a Tasco PDP3 Red-Dot. The turkey don't like it! I love this gun. it bounces the wad off their head. Last edited by larpyn : 01-18-2008 at 02:07 PM. My turkey setup is the Gimpy Guy from North GA. I'm gonna set him up and he's gonna kill the turkeys. sounds good to me bud! Browning 10 ga with some work done to it and the choke built by Gunn Doc. Shooting Nitro out of it. Picking up a Benelli 20ga in a couple weeks with a Pure Gold choke. An old Savage 220 Gun Docc Special, with a TruGlo choke, shooting Winchester High Velocity, 3 inch, #4s. Send a private message to G.G. Find all posts by G.G. Jesus, a cheap as hell mossberg maverick I bought from Arrow 3 out of a parking lot with a standard full choke. As long as you don't try to kill em at 55 yards (4x) it'll drop em in their tracks all day. I used to shoot an NEF single shot with a built in modified choke. I"ve killed two with that at 35 and 40 yards. Both dropped dead in their tracks. I'm a firm believer that you don't need anything special to kill those old yard birds. Oh, and I'll shoot whatever turkey shells I have laying around. Usually 3 inch number fives, but I've been known to pop em with 6's and 4's as well.